For Spring/Summer 2017-2018 Les Benjamins has imagined a world where streetwear meets Aboriginal culture. A magnificent voyage into Australian heritage, twisted with the signature modern touch of Bunyamin Aydin, Les Benjaminsʼ founder. Today, this ancient civilization is at risk of being lost forever but community elders keep their cultural heritage alive by passing on their knowledge, art, rituals and performances from one generation to the next. A beautiful message that the brand has materalized through elegant patterns, delicate garnments and radical embroideries. From this creative journey emerged an urban wardrobe that seems to rise up from the Australian beautiful landscape. The collection exalted with immeasurable craftmanship using hand painting techniques, thread embroidery, print collages mixed with Aborignal symbols. 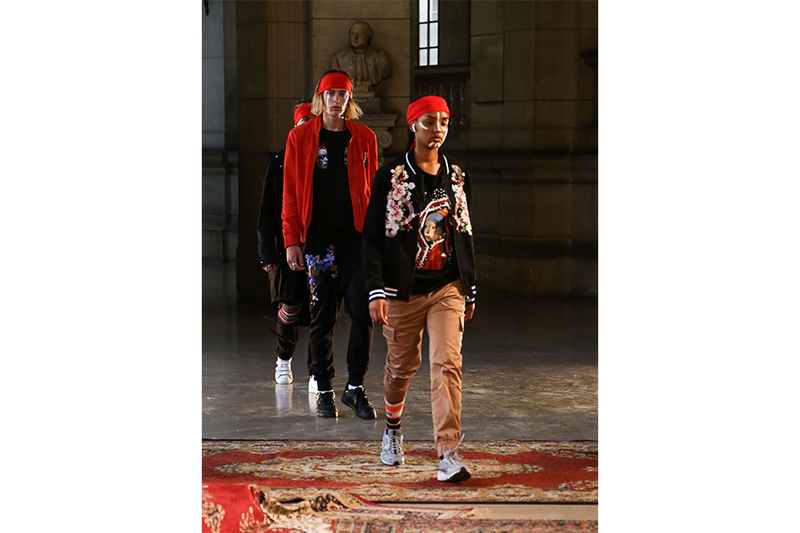 Les Benjamins once again makes strong statements inspired by British colonialism with military detailing and an approprition of 17th and 18th century paintings. This is more than just a collection, more than a fashion brand. Itʼs a real cultural movement that empowers togetherness and awareness about the world we live in.